Bay Area Rapid Transit (BART) Trains operate from Fremont, Richmond, Bay Point/Concord and San Francisco/Daly City and include service to San Francisco International Airport. Tickets can be bought in vending machines at the BART stations. BART connects to Oakland International Airport via a short hop on an AirBart shuttle bus. A map indicating the route and stops of each train is located at each BART station. The Berkeley BART station is just 1-1/2 blocks west of the Berkeley campus. From San Francisco: Board a Richmond bound train in San Francisco, or if you come from the Airport, change to a Richmond bound train somewhere in San Francisco (refer to BART maps). Get off at the Berkeley Station (aka Downtown Berkeley). 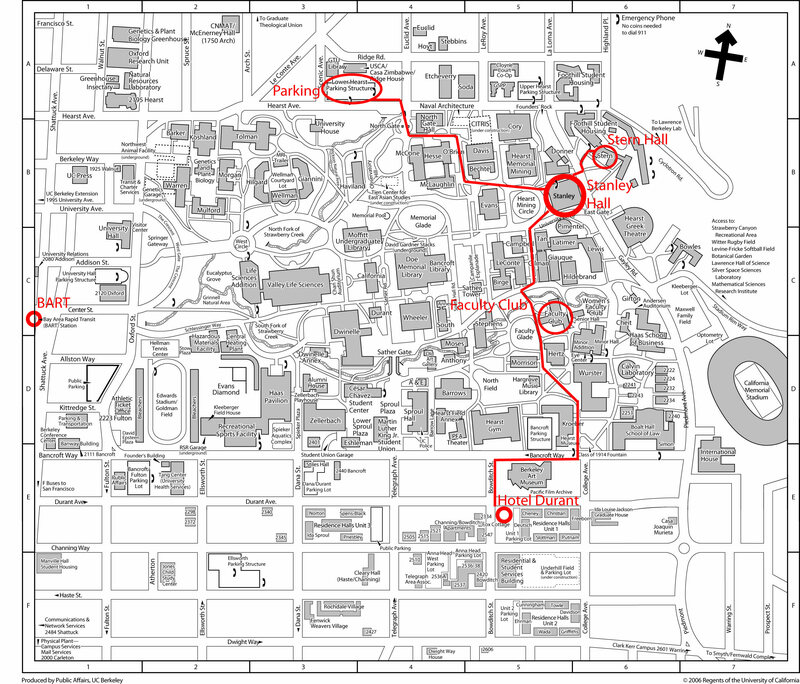 Walk east on Center Street for 1 block to the campus. Continue East (uphill) to Stanley Hall. The BayPorter shuttle service operates between San Francisco International Airport and the East Bay (where Berkeley is located).